Grooming a schnauzer puppy is the same as grooming an adult. Standard schnauzers are the mid-size versions of the schnauzer breeds, situated between the giant and miniature versions. 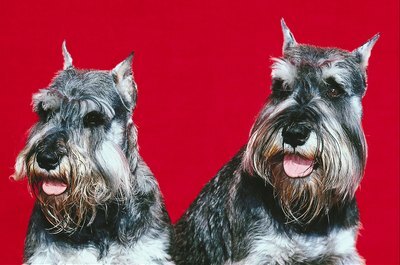 The schnauzer's wiry double-layer coat marks him as a terrier and requires regular grooming to stay neat. Puppies need the same grooming as adults, just with more patience. Thanks to their energy levels and playful nature, grooming schnauzer puppies can be frustrating from the beginning. But schnauzers need direction and guidance, so the key is to introduce grooming right away and teach your pup exactly what's expected of him. Brush him every night with a pin or slicker brush, whether he needs it or not, to get him used to the routine and experience. Offer encouraging words and keep the early sessions short so you don't exhaust his patience. Slowly lengthen the time you spend brushing him as he becomes familiar with it and accepts it better. Schnauzers shed very little, but that doesn't mean your pup doesn't need regular coat maintenance. Once your pup is used to grooming, brush him with a pin or slicker brush at least a few times a week to remove any loose, dead hair before it tangles and causes mats. His wiry topcoat needs to be stripped two or three times a year to encourage new growth, by manual finger plucking or using a stripping tool. Shaving his coat down with clippers performs the same chore but alters his coat's texture from coarse and wiry to a much softer feel. For grooming that requires trimming, defer to a professional. Schnauzers are inquisitive little critters with a long history as hunters and working dogs, so they'll no doubt find themselves in dirty situations. Bathe your puppy only when he needs it, with a mild shampoo specifically formulated for dogs. Once every few months should suffice, unless your pooch has found his way into something particularly smelly or messy. Bathing him too often can strip his coat and skin of its natural oils, which can result in dry, itchy skin and a dull coat. Rinse him thoroughly after you've massaged the shampoo in, and keep rinsing until you're sure all the shampoo is gone. Towel-dry him, then finish up with a hair dryer on a low-heat setting or let him air-dry. Your puppy will need regular haircut maintenance to attain that distinctive schnauzer look, with its bushy eyebrows and long beard. But leave the scissors and the clippers alone. This is not a chore to do yourself. Leave it to a professional groomer. As with home grooming, get your puppy accustomed to professional groomer visits early so he won't be afraid or difficult to handle. Your groomer will clip or strip his coat depending on your preference and trim up his edges to make him look neat and adorable. Have your groomer trim his toenails while he's there. "The Behavioral Differences Between a Miniature, Standard & Giant Schnauzer"
What Are Schnauzers Prone To?